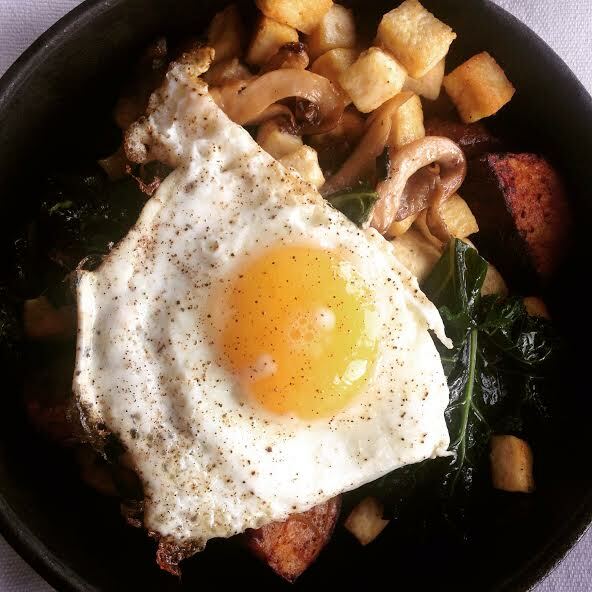 Roofers Union | Gluten Free D.C.
What I got: Tofu scramble with mushrooms, spinach, kale and a fried egg. Big taste, small portion. I felt like I needed to go home and eat something else. It was also on the expensive side. Gluten-free friendliness: Brunch usually guarantees there will be at least one egg-related gluten-free option. Roofers Union has three: tofu scramble, eggs Benedict and “farmer’s choice,” two eggs your way. The eggs Benedict are served on an english muffin though, so ¯\_(ツ)_/¯. Otherwise, you’re looking at the not-so-friendly options of fried chicken and various waffles. Their dinner menu offers more choices, including mussels, trout and duck. But if I didn’t want to spend that much on their brunch, I probably won’t be having dinner there anytime soon. Overall vibe: The restaurant was bizarrely uncrowded for a Saturday morning. Every time I walk by it seems packed, which makes me think it’s more a bar/dinner scene. The lack of crowd might be the best thing going for this place. Also, the huge floor-to-ceiling windows provide plenty of natural light which is nice in the middle of winter. This entry was posted in Adams Morgan and tagged Adams Morgan, Brunch, Eggs, GFDC, Gluten-free diet, Gluten-free food, Gluten-free foods, tofu. Bookmark the permalink.